More than $1.6 trillion in mortgage loans mature over the next five years, creating an opportunity for commercial mortgage real estate investment trusts (REITs) and other private real estate direct lenders that finance income-producing properties like apartments, hotels, offices, industrial facilities and retail centers. Many large lenders of the past (commercial banks, thrifts and insurance companies) no longer are able to compete in this refinancing environment. Banks and other traditional commercial real estate lenders have decreased debt originations in large part due to an increasingly restrictive regulatory environment, which is expected to continue if not intensify. Commercial mortgage-backed securities (CMBS) lenders also face a number of headwinds amid regulatory changes, such as the retention rules set forth in the Dodd-Frank Act and higher capital charges on certain securities held by investment banks. As a result, there is a limited lending supply and increased demand for financing and refinancing, which is creating a void that can be filled by alternative providers such as REITs and private investment funds, which are not subject to many of the regulatory requirements of larger banks, insurance companies and other financial institutions. In the continued search for yield, investors may want to consider mortgage REITs for income potential, which compares favorably to other alternatives. Given that some mortgage REITs focus on short-term floating-rate loans, which can keep pace with rate increases, the appeal of this asset class becomes even more desirable in a rising interest rate market. In a floating-rate loan structure, however, there is the chance mortgage holders will not be able to keep up with increased payments. Some of the risks related to investing in commercial real estate – the properties underlying the debt – include local property supply and demand conditions, tenants’ inability to pay rent and increases in operating costs, to name a few. Source: Trepp - Based on Federal Reserve Flow of Funds Data. There is no guarantee that market conditions will continue or be profitable. The general objective of a commercial mortgage REIT is to earn money on the interest rate or lending rate they charge over the course of a loan. Investments may include commercial mortgages as well as both rated and unrated CMBS, mezzanine loans, and subordinated securities. These investments may be lower credit quality, and may have a higher risk of default and loss than investment grade rated assets. 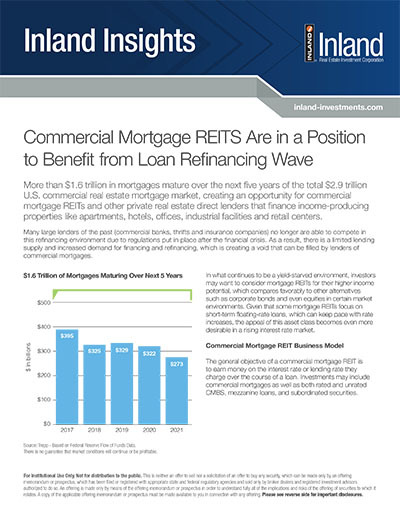 Commercial mortgage REIT portfolio managers typically evaluate potential investments to determine if they meet the investment criteria and objectives of the REIT. Commercial properties underlying the debt are often inspected and several factors are considered, including macroeconomic conditions, the amount of existing debt, the opportunity for capital appreciation and expected levels of rental and occupancy rates. In addition, risk management control systems are put in place to monitor cash flow and a comprehensive analysis of the loan portfolio regularly takes place. Over a 20-year time period, commercial real estate mortgages delivered a higher total return with less volatility than investment grade corporate bonds, as measured by LifeComps Commercial Mortgage Loan Index and Barclays Investment Grade Corporate Bond Index. Investors looking for income solutions may want to consider mortgage REITs as part of a diversified portfolio. The chart above is for illustrative purposes to compare the historical returns of commercial mortgages and investment grade corporate bonds, which share similar duration. The Barclays Investment Grade Corporate Bond Index, officially known as Bloomberg Barclays US Corporate Total Return Value Unhedged USD, measures the investment grade, fixed-rate, taxable corporate bond market. It includes USD denominated securities publicly issued by US and non-US industrial, utility and financial issuers. The LifeComps Commercial Mortgage Loan Index is the only published benchmark for the private commercial mortgage market based on actual mortgage loan cash flow and performance data, which has been collected quarterly from participating life insurance companies since 1996. Active loans in the LifeComps Index number approximately 4,500 with an aggregate principal balance of $111.8 billion and market value of $119.2 billion. The weighted average duration is 5.5 years and average reported loan-to-value is 50 percent. An investor cannot invest directly in an index, and index performance does not reflect the deduction of fees, expenses or taxes. The performance data shown represents past performance, which is not a guarantee of future results. Return Calculations: Total return indicated is compound annual growth rate (CAGR) for Bloomberg Barclays US Corporate Total Return Value Unhedged USD. LifeComps Commercial Mortgage Loan Index is average annualized returns. The views expressed herein are subject to change based upon economic, real estate and other market conditions. These views should not be relied upon for investment advice. Any forward-looking statements are based on information currently available to us and are subject to a number of known and unknown risks, uncertainties and factors which may cause actual results, performance or achievements to be materially different from any future results, performance or achievements expressed or implied by these forward-looking statements. Distributions cannot be guaranteed and may be paid from sources other than cash flow from operations, including borrowings and net offering proceeds. Payments of distributions using offering or financing proceeds will reduce the amount of capital a REIT ultimately invests in real estate assets and a stockholder’s overall return may be reduced. Failure to qualify as a REIT and thus being required to pay federal, state and local taxes, which may reduce the amount of cash available for distributions. Principal and interest payments on borrowings will reduce the funds available for other purposes, including distributions to stockholders. In addition, rates on loans can adjust to higher levels, and there is a potential for default on loans. Conflicts of interest with, and payments of significant fees to, a business manager, real estate manager or other affiliates. Tax implications are different for each stockholder. Stockholders should consult a tax advisor. The Inland name and logo are registered trademarks being used under license. This material has been prepared by Inland Real Estate Investment Corporation (Inland Investments) and distributed by Inland Securities Corporation, member FINRA/SIPC, dealer manager and placement agent for programs sponsored by Inland Investments and Inland Private Capital Corporation.